I had one of those... the barrel was shot out after five rounds so I never got it sighted in. I had to use solid bronze bullets so they would stay together at 5800 fps. If anyone is interested I'll sell it with a box of 95 bullets and the dies. I used up the pound of powder. The above is just a story. 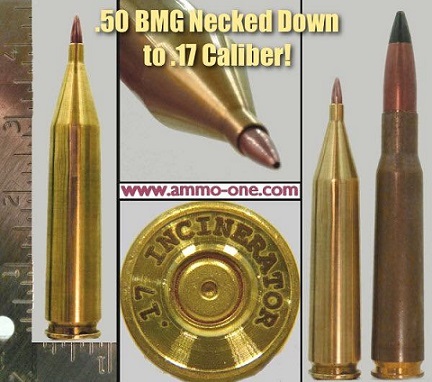 I don't now and have never owned any gun that uses a 50 BMG case. they did neck .30-06 down to 17 years and years back.....needed to use solid copper projectiles (before they were common) to hold them together but yeah nah it didnt take off. That case might even exceed max chamber pressure without a bullet in it! I don't know, I guess it's all in the powder you need to get the pressure for a clean burn with a 30 grain Berger. I would bet that H4895 would be close to the right powder but it won't fill the case. All the powders for the BMG are too slow for the light bullet so H4831? I think the round would be a reloaders nightmare. We could just fill the case with H1000 and push a bullet in to see what would happen when somebody we don't like shot it. I think it would push a flame about 10 feet out the muzzle and the bullet would race away at nearly the speed of sound. Like a fizzled M-80. On the other hand with the slow rifle powder it might go PPPPHHHHHHT BOOOM! Throwing the bolt through the shooters lower jaw and various pieces of the rifle through extremities. It would be real interesting to watch - from a distance - but not much fun from the shooters perspective.